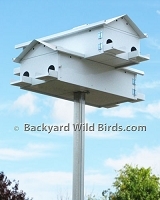 Purple Martin Pole Systems include Purple Martin Houses and Purple Martin Poles. 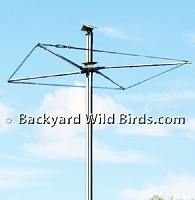 Purple Martin House Pole System includes cross bar rack, pole, winch and Ground socket. Pole Predator Cylinder Guard is designed to fit the 2 inch square pole of our Tall Bird Pole Rack system and Purple Martin Pole System (sold separately). 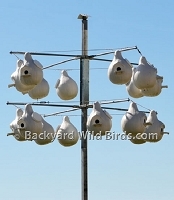 Purple Martin Gourd Houses is an 8 Pack of 2 clam shell pieces which are easy clean gourds that are Starling resistant. Purple Martin Excluder Super Gourd House with excluder holes are 1 piece molded design gourd with screw on cap for viewing and cleaning. This is for 1 individual Super Gourd, order as many as you like. 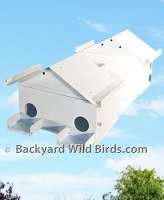 Purple Martin Goliad Add A Floor has 4 Rooms to add to your existing Goliad Purple Martin Houses. 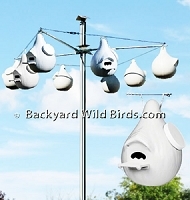 Great way to grow your Purple Martin colony! Purple Martin House Alamo with Crescent Doors. Alamo houses have 14 large compartments where Martins will thrive and remember their Alamo Purple Martin Houses year after year. Purple Martin House Goliad Jr has 8 room with crescent doors. 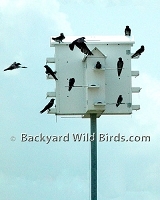 The Purple Martin Goliad Jr. is a Purple Martin starter house with two floors of stackable housing units. Purple Martin Pole System is a single pole that includes a winch with cable, pulley and ground socket. Purple Martin Pole is a 2 inch square pole that is 16.5 ft tall. The Houses and Rack systems in this category are made to work with this pole. 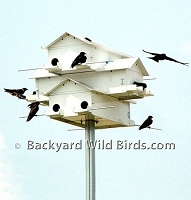 The Purple Martin Stackable Houses Goliad is one of the most flexible Purple Martin Houses on the market. It has the ability to stack additional floors to expand the colony.